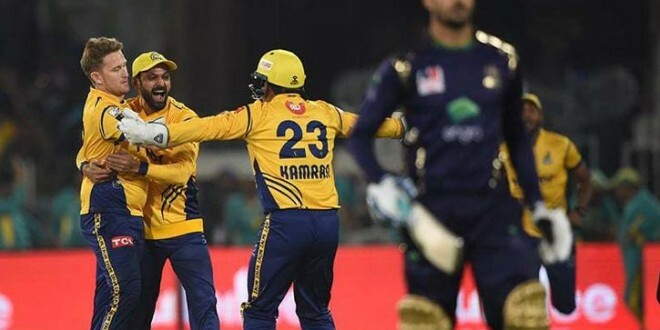 After so many speculations, finally the playoff round match of ongoing season of Pakistan Super league was executed in Pakistan and in the eliminator round, the match was hosted between Peshawar Zalmi and Quetta Gladiators. In the match, Quetta Gladiators was eliminated from playoff. Basically all the season specially the all group stage matches in Pakistan Super League 2018 were executed in two venues in United Arab Emirates (UAE). The venue in Sharjah and Dubai, the matches were executed. But PCB always wanted to arrange the competition at the home venue of Pakistan but due to security problem, ICC could not give them clearances. Now, they hosted some matches from playoff and final of Pakistan Super League 2018 in Pakistan. The first match in Pakistan was the eliminator round. The match was executed between the defending champion Zalmi and current runner up Quetta Gladiators. In the match Peshawar Zalmi destroyed Gladiators by only one run and qualified for the 2nd qualifier round. Peshawar Zalmi once tested the title of PSL which makes them very countable to the other teams in PSL. Now, they are on the way to the 2nd title. As the 3rd and 4th ranked team considering the group stage, Peshawar Zalmi and Gladiators had to play the eliminator round and the winner of the eliminator round will get chance to play the final through 2nd qualifier. Now, in front of Peshawar Zalmi, they have one most powerful obstacle is placed. The 2nd qualifier opponent of Zalmi is Karachi Kings which is in very charming form this season. On the other hand, Quetta Gladiators is very potential team in PSL but at the end they seems out of luck. Just for one run, they could not qualify for the 2nd qualifier. The eliminator round was executed in 20th March, 2018 at Gaddafi Stadium, Lahore where Aleem Dar and Rashid Riaz were the field umpires. Quetta Gladiators got the luck first and won the toss. The decided to bowl first which was an wise decision. So, the current champion Peshawar Zalmi came to bat first and scored 157 runs in 20 overs. They lost all wickets in the match but played full overs so far. Liam Dawson scored highest 62 runs in 35 balls for Zalmi. Rahat Ali took highest four wickets for Gladiators. But finally Quetta Gladiators could not score such amount though they scored 156 runs in 20 overs. They lost nine wickets in the match where Sarfraz Ahmed scored highest 35 runs so far. Hasan Ali and Sameen Gul took two wickets each for the team Peshawar Zalmi.